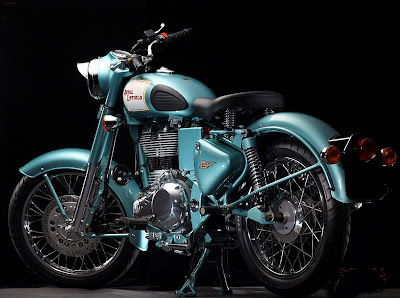 Readers Johann Franz and Michael Clark sprang to my aid when I complained that I hadn't seen a picture of the left-hand side of the new Royal Enfield Bullet Classic 500. The new bike was unveiled Tuesday at a ceremony in Germany but seems to have kept its right side facing the cameras. Thank you Johann and Michael. To my eye, the new motorcycle is even sexier from this angle. Personally, I would remove the headlamp visor, but that's just a matter of taste. Johann points out that the horn is still mounted to the frame on the left. I guessed wrongly that it had moved up under the headlamp. Yes, it does look great from the left side. I'd say RE got it correct from the styling department. Now when will it come to the states?